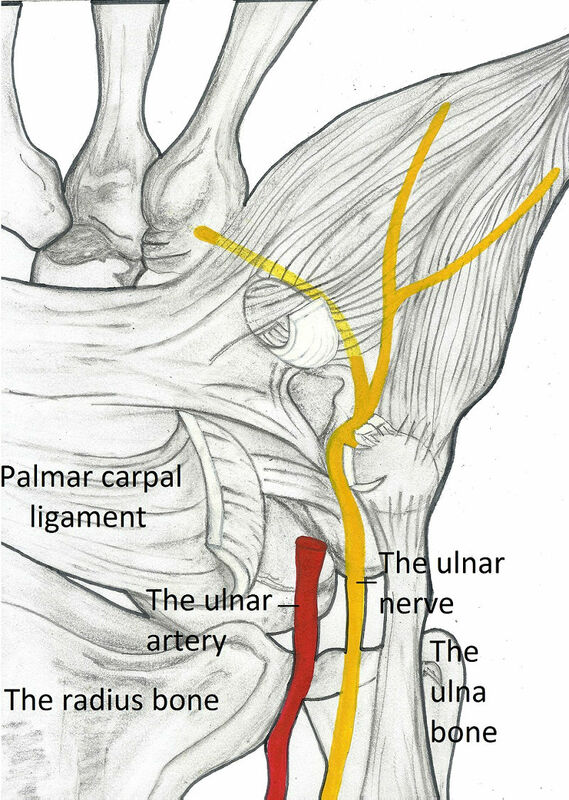 the ulnar nerve is more likely affected in the elbow than in the wrist. Positive Tinel’s sign in the ulnar nerve entrapment or injury — tapping over the ulnar nerve triggers pain or tingling in the wrist or the pinky side of the palm or in the pinky finger 12,13,14. Positive Phalen’s sign: maximal bending (flexion) of the wrist (hands with their back sides put together, hands hanging down) for more than one minute results in paresthesia in the 4th and 5th finger 14. In case of ganglion cyst or tumor, there can be visible or palpable mass in the wrist. 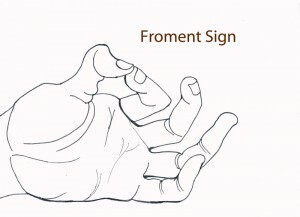 Froment’s sign. Weak pinch strength because the muscle that moves the thumb toward the palm (musculus adductor pollicis) is affected. A doctor can ask a person to hold a piece of paper or a card between his or her thumb and index finger; when the doctor pulls the paper, the affected person is not able to hold it 6,9. Wartenberg’s sign. A person fully extends all fingers with the palm facing down. Then he or she spreads all fingers and then he or she puts them together again. The inability to move the pinky finger close to other fingers speak for ulnar nerve palsy, but not specifically for the Guyon’s canal syndrome (so the site of nerve damage cannot be determined solely from this sign) 4,15.
he or she cannot move the thumb toward the palm, so he or she bends the last thumb joint instead. 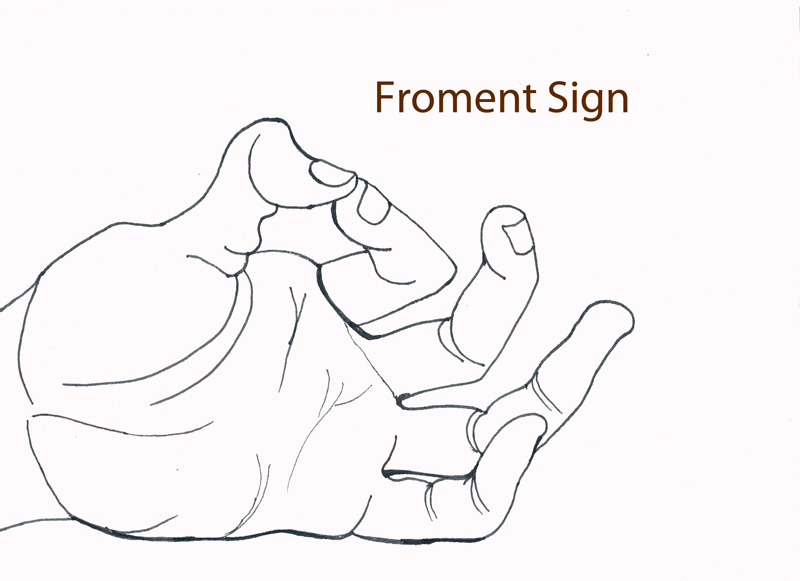 NOTE: Individuals who have only the sensory branch of the ulnar nerve damaged will be able to make a normal pinch (no Froment’s sign). 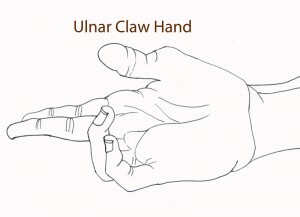 When a person with Guyon’s canal syndrome and a damaged motor branch of the ulnar nerve holds the hand passively, his or her 5th and 4th finger are in the “ulnar claw” position. 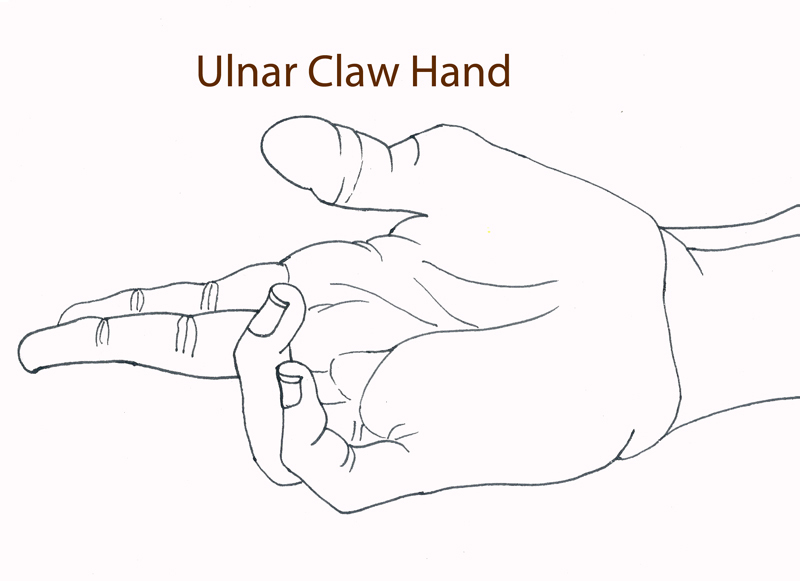 Wasting of the hypothenar muscles in the hand and weakness of the grasp and pinch. Picture 4. Cyclist or handlebar palsy. can cause pain in the wrist and numbness in the 4th and 5th finger. 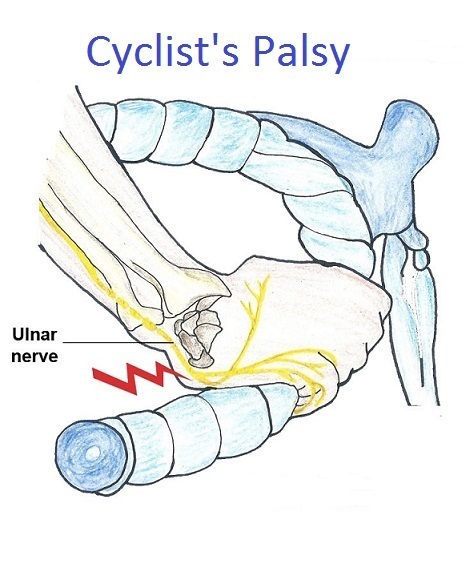 When the cause is obvious (bicycling, crutches) the diagnosis of Guyon’s canal syndrome can be made from symptoms and signs 5. X-ray or CT scan can show the wrist fracture. CT or MRI of the wrist can show soft tumors and ganglion cyst. Doppler ultrasonography or arteriography can reveal ulnar artery aneurysm or thrombosis. Electromyography (EMG) and nerve conduction tests can help determine the exact point of nerve entrapment. The affected person can expect improvement of symptoms in four to six weeks after the onset of the conservative therapy 8. Decompression surgery to release the ulnar nerve: cutting the ligament that covers the ulnar nerve (Picture 5), removing the cyst or tumor or correcting other abnormality in the wrist. 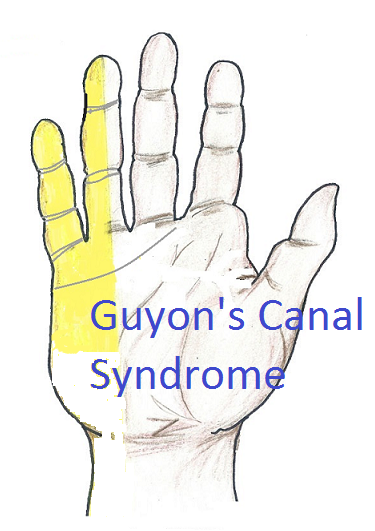 Surgical treatment of Guyon’s canal syndrome is effective in 60-95% cases. Possible complications of surgery: palmar hypersensitivity, persistent numbness, surgical wound infection, wound dehiscence. 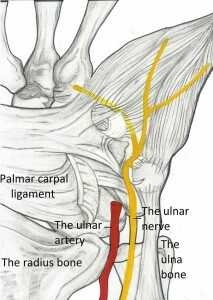 and thus releases the underlying ulnar nerve. Is it possible to have both carpal tunnel syndrome and guyons canal syndrome? If so would the surgeon need to make 2 incisions? Yes, it’s possible. A surgeon can explain in advance what needs to be done. The tingling and pain limited to the pinky and ring finger can be from a compression of the ulnar nerve in the wrist or on the pinky side of the hand. The pain that starts at the elbow can be from a compression of the same nerve in the elbow, known as cubital tunnel syndrome, which occurs due to repeated bending of the elbow. The both conditions are mentioned (with pictures) in the article about arm pain. A wrist brace may help, but most pain relief you can expect after some period of resting the affected arm. I’m not aware of any OTC painkiller that would be significantly stronger than ibuprofen. Occupational therapist often treat Guyon’s Canal Syndrome as well (typically through splinting.) After surgery an OT can provide rehabilitation services as well such as PROM, AROM, scar massage, and later strengthening exercises. It’s surprising that this profession would be left out of an article on this condition. Liz, in the article I concentrated on symptoms, so one can recognize the condition. It then depends on the doctors involved in the initial treatment to decide who will be involved in rehabilitation.